#TuesdayTune ~ Will you be seeing The Great Gatsby? The Great Gatsby follows would-be writer Nick Carraway as he leaves the Midwest and comes to New York City in the spring of 1922, an era of loosening morals, glittering jazz, bootleg kings, and sky-rocketing stocks. Chasing his own American Dream, Nick lands next door to a mysterious, party-giving millionaire, Jay Gatsby, and across the bay from his cousin, Daisy, and her philandering, blue-blooded husband, Tom Buchanan. It is thus that Nick is drawn into the captivating world of the super rich, their illusions, loves and deceits. As Nick bears witness, within and without of the world he inhabits, he pens a tale of impossible love, incorruptible dreams and high-octane tragedy, and holds a mirror to our own modern times and struggles. Everything about the movie looks stunning! I love this behind-the-scenes look inside Baz Luhrmann's adaptation of The Great Gatsby, including interviews with the film's costume and production designer Catherine Martin and director Baz Luhrmann. The Brooks Brothers costumes look gorgeous! Tiffany & Co. is the official jeweler for the film. Tiffany has created a collection of platinum-set diamonds and pearls that complement the period clothes. The opulent jewelry gives the actors a true sense of the high life as celebrated by their characters at penthouse parties and summer soirées at grand estates. I adore this song from Lana Del Ray - what an amazing voice. If this film is anything like Moulin Rouge or Romeo and Juliet it's going to be brilliant! 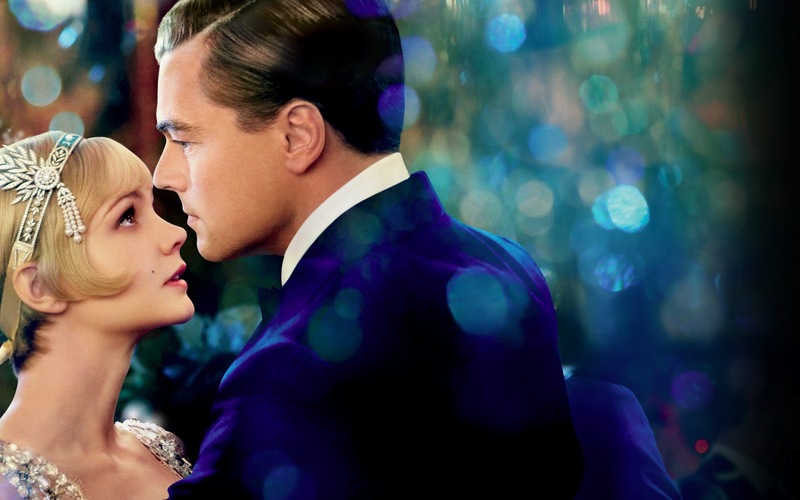 Will you be seeing The Great Gatsby this May? Oh I can't wait!!!! I LOVE Baz Lehrman's work and have adored the Great Gatsby since highschool when I had to do a book review for English Lit class. it's going to be my Mother's Day weekend plan!!! That sounds like a great way to spend Mother's Day. I studied it at school too and have taught it as well. It's a great book and if it has the Baz Luhrman touch it's going to be a very spectacular movie! Tell me what you think please-it doesn't come out here until later in the month! oh yes I will be seeing it! first one was shot on Newport RI about 20 minutes away for me, cannot wait to see the glamour in the new one! I don't know...I like the book and I like Toby Maguire, but Leo makes my slapping hand itch. I must be the only one in the world who does not like Titanic. Oh boy, I can't wait too!! This is my kinda movie and I love the actors. I remember the first version in the 70's with Robert Redford, Barbara Streisand, Karen Black, etc. Thanks for sharing Natasha, I didn't know about the new movie. I have all of Scott Fitzgeld's books and of course, Ernest Hemingway's as well. It looks so amazing Fabby! I used to teach The Great Gatsby so love the Robert Redford version. This one will no doubt be truly amazing. If you see it please let me know what you think of it! Although I never read the book, I think this is going to be a big hit. I love the costumes of that time period - they are so elegant. I will likely catch it when it gets to the on-demand stage. I loved the book and the movie version with Mia Farrow and Robert Redford. Like Katie above, I am not a big fan of Leonardo and did not like Titanic! Thanks so much for stopping by! I had to tell you that I emailed Katie and let her know that I can't stand Titantic! I always felt like the odd one out so now I feel so much better knowing that there are three of us who don't like it! I do like Leonardo though! Oh...I cannot wait!!!! I've been looking forward to this for so long. My Mom and I will be going for Mother's Day. The Great Gatsby is just about my favorite novel. I've read it a dozen times. I think Leonardo and Carey were great choices. Robert Redford was the perfect Gatsby in the previous version but I hated Mia Farrow in it. I am sure Leonardo will be even better than Redford. Leonardo can do no wrong in my opinion. I'm sure it's just going to be a feast for the senses! I can't wait to see it too. It doesn't come out here until the end of May so it's going to kill me hearing about it from all my American blogger friends! I hope you have a wonderful time seeing it with your Mom! Thanks for stopping by-it was so nice to hear from you! I did not know Toby was going to be in it... oh, I so want to see this. I have had the movie date on my calendar for months now! I'm looking forward to seeing Tobey too...I am more excited about seeing him than Leonardo to be truthful! I hope you enjoy it! Of course I couldn't resist clicking on Leo on the way out. ;) I cannot wait for this film and I so hope he finally wins an Oscar. It's about time! I can't wait to see this movie. The glittering flapper dress and it's accessories will be soooo gorgeous. I remember when saw the Great Gatsby with Robert Redford many years a go and it was filmed near by our house now in Great Neck, Long island, New York in the community called Kings Point. This community has amazing huge houses by the bay. I love Leonardo di Caprio; what a great actor! I will probably see it since I can't resist costume films. I like some of Baz Luhrmann's films, like Strictly Ballroom but others I haven't loved. I hope this one is good. Funny to happen upon your blog, because I just saw for the first time today the previews for this movie. It seems like it is going to be amazing. I look forward to seeing it. I almost want to dress up like a flap girl when I do go see it. Fashion Friday, Friday Features & Nantucket!